Drupal's OpenID module is somewhat not complete. This form was always puzzling me: instead of remembering passwords, are now users supposed to remember their OpenID URLs? For example, Google's OpenID URL format is "https://www.google.com/accounts/o8/id?id=<40-digit hash code>", and if user wants to login w/ Gmail account, is user supposed to type-in that string, or copy-paste the string from some place? This form does not make Drupal's default login form any simpler, it makes it only harder. That's why I was never enabling OpenID module on any of my Drupal sites. After one day of heavy tweaking, I was able to marry it w/ Drupal's OpenID module. User profile's "OpenID identities" form at "/user/<id>/openid" has been enhanced w/ openid-selector as well. Now, I release the module integrating OpenID Selector w/ Drupal as open source under GPL v2 license. You can find it attached. Feel free to use it on your websites and unveil the true power of Drupal's OpenID module! You should restore(uncomment) this line back on disabling the module. Newer versions of the module do not require patching of Drupal core anymore. OpenID Selector is now available on Drupal.org at http://drupal.org/project/openid_selector, please download OpenID Selector from there. Looks great, but I get a 404/page not found error after trying to log in with Google. Also, I wish we didn't have to patch core. this is a configuration problem, to fix read this post. This module does show the selector to add your ID to your profile, but not on the index page. It keeps showing the "old" type your url openid login at the loginbox. What am I doing wrong? only full login form at path "/user/login" is supported as of now. will make login block (box) supported soon. It seems I can only login with google openID even though i tried to login in with different (offcourse existing) accounts or trying to attach them to an existing drupal account. It keeps saying that the accounts don't exist. I used your .zip and patched the core. I can't find where it goes wrong in the code and on the gerixsoft site it works like a charm. Can you help me again? Which exactly OpenID providers do not work? What Drupal version/host OS are you running? Is your site available on the net, so I can try signing-in? Only Google works, but i am uninstalling everything and trying to reinstall all. I'll let you know what happends. ok, just in case, please re-download and re-install openid-selector.zip, I have fixed a couple of bugs in newer version. Please read about new version changes on drupal.org/node/838862 -- I am trying to make it "official" at drupal.org. Ok, it seems that the problem is in my openid core files. Because even if openidselector is off i cant login with any other account than google. But still thanks for your help. It seems that openID selector is preventing openID registrations on my site: after enabling openID selector, attempts to register a new user with openID simply redirect back to the login page. Once i disabled it, i was able to login/register a new user without any problem. I am using drupal 6.19 on 64 bit linux, and the most recent version of your module. If it is convenient for you, please email me, and we can work together to figure out where this issue stems from. Can you register w/ default Drupal OpenID module? i.e. by pasting OpenID URL string in the default OpenID login form? User web browser could be a problem -- I have recently fixed couple of bugs occuring in Chrome, Safari and Opera -- please download newer version. Is your website available online, so I can test the problem live? Yes, the default OpenID module works fine; as soon as i disabled OpenID Selector, I was able to register with my OpenID. Browser should not have been the problem either, I'm using Firefox. I will update the module tonight though, and see if that helps. The site is live, but only for testing at the moment, so I would prefer not to post the URL here; i have sent it to you through your contact form, with subject "OpenID Selector issue". update for readers of my blog: the problem is w/ default OpenID module. I don't see any options for any OpenId modules under permissions nor do I see any blocks pertaining to OpenId. On the login box/page it just shows the plain old OpenId URL field, same as in the profile edit page. Did I miss something? When I move libraries from modules to the parent, all, Drupal Administration says that Libraries is no longer installed (missing). Your README instructions need to be fixed. In either case, it still isn't working on my end. README is correct in both cases. JS must be installed in /sites/all/libraries/openid-selector, not "move libraries from modules to the parent, all," as you say. 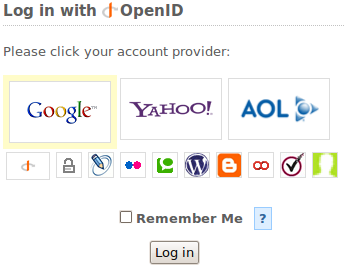 So I can add myself to openid after im logged in but http://site.com/user/login shows the old openid box?? i am new to drupal just using it from few weeks now.i want to integrate openid on my site.so i installed the openid-selector .its showing up correctly only problem is its not letting me login directly with out the registration.after i authenticate at the google login its redirecting me back to registration page on my drupal site and display me this message "Please complete the registration by filling out the form below. If you already have an account, you can log in now and add your OpenID under "My account"." see http://drupal.org/node/946998#comment-3628378 -- this is a patch that introduces attribute exchange to Drupal 6, code is backported from Drupal 7.
thank for the patch google login is working perfectly.but i am not able use yahoo and linkedin login to auto-register the account .please help out for this case.. i have installed linkedin dev module. the selector should prominently invite those with private openid servers. If a user's openid provider is not in the list, this is a disincentive to use openid for them. Can "clicking on the google image to login" be automated? So step2 is instead of clicking on the google image to login. I've really tried getting this to work but it's too hard for me. I thought that accessing this url "https://www.google.com/accounts/o8/id?id=40-chars-here" after visiting http://www.mysite.com/user would result in the same thing as clicking the google image ;) However, there is some voodoo stuff going on that is just over my head. Anyway, thanks for doing a great job! Very complicate topic though! I'm impressed and enjoying announcement about openid topic. Thanks for such brilliant feedback indeed. Keep it up continue! Definitely I was totally amazed to hear that openid announcement. I believe that it bears very posting sounds. I hope I will select drupal module for my workshop. Thanks! Hi I was wondering if it's possible to grab the full name as a login name. Instead of asking the user to type one. Quite the same as the form to ask this question, My name was filled in 2. It would be nice to have a URL box for those of us with private Openid servers. On the regular Openid, a cookie stores the last URL and puts it in the box. Not to say that having the facebook, google et al available as icons is not necessary, but the option of having a box would be nice also. Some of us would like to just have a few. Setting the configuration so you can checkbox the icons you want to show up would be nice. Display the block in a region, OpenID Selector not shown - standard OpenID form is shown. Any idea's how I can do this? If I display the login block twice, using whatever method, it reverts to the standard. If I display it only once, I get the OpenID Selector.